In the picture below you will see a Chinese face map. 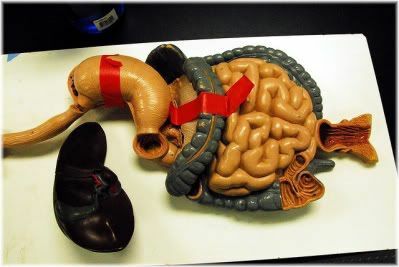 It shows the different parts of the face and their corresponding internal organ. 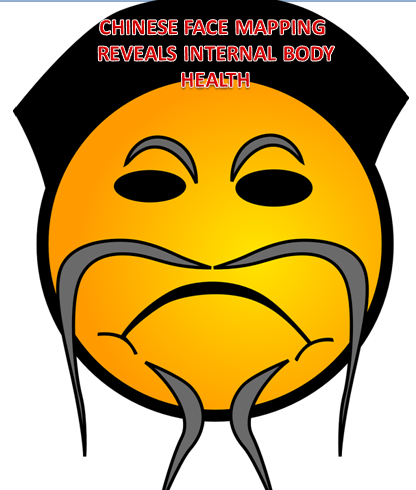 The Chinese believe that you can tell a lot about the health of your body simply by looking at your face. 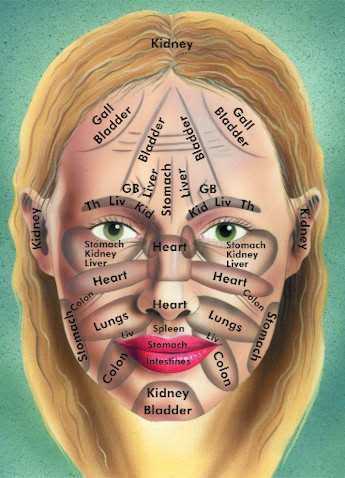 What does your face say about the health of your body? 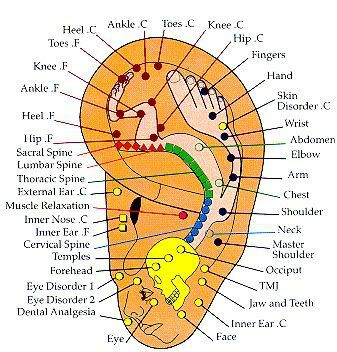 A similar reading can also be done with the ear, as shown in the picture below of a Chinese ear chart which also depicts the ear reflexology points. 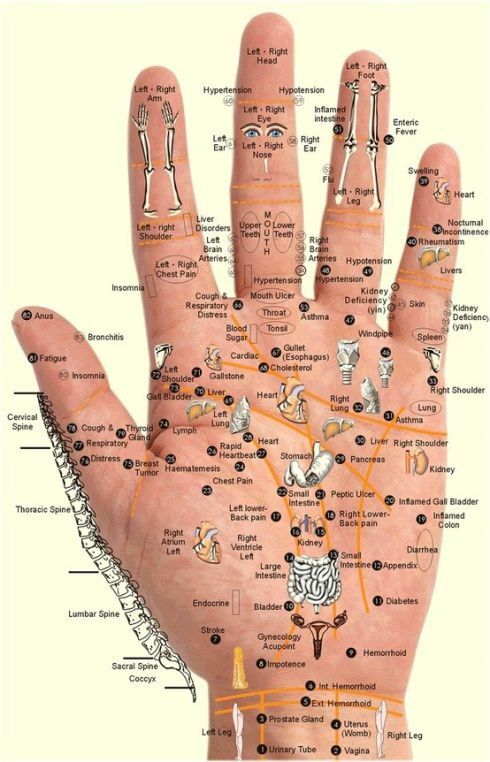 Readings can also be obtained with the hand, as shown in the picture below of a Chinese hand map. And finally, with the feet, as shown in the picture below of a Chinese reflexology foot chart. 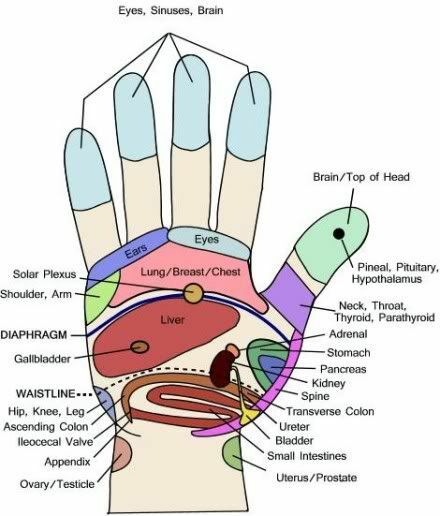 When you look at the arrangements of the organs in the charts, it’s almost like you have a mini version of your body in your ears, hands and feet. Just like how you do on the face. Perhaps by stimulating these areas, such as through massage or with acupuncture needles, you may also be stimulating regions in the brain that correspond to a given organ. 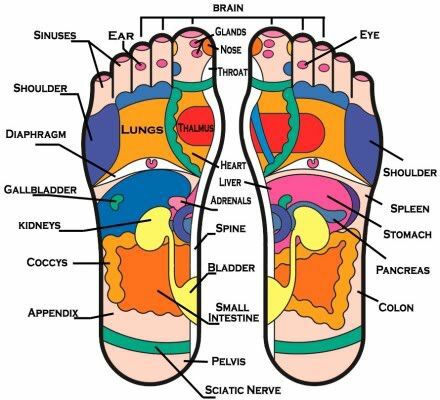 This might be why people can often obtain therapeutic effects from massage, reflexology and acupuncture, because those practices may be stimulating organs which then produces some kind of beneficial effect. Even parts of the brain can be mapped like a mini body. Interestingly, regions in the brain can also be mapped like a miniature body. 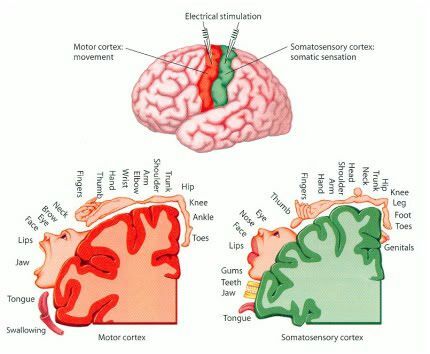 As shown in the picture above, for example, both the motor and sensory homunculi have areas that correspond to specific body parts. So if parts of the brain can be mapped like a miniature body, then perhaps the same can also apply to the ears, face, hands and feet. Just like what the ancient Chinese believed thousands of years ago. 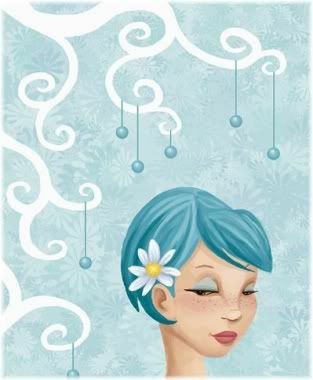 Blue on the face can indicate problems relating to the kidneys or adrenal glands. A shade of dark blue that appears underneath the eyes, where people tend to get eye bags, relates to overwork and imbalance of the kidneys and adrenals. This could be caused by not drinking enough water, or by constantly feeling stressed and being unable to relax or sleep properly. 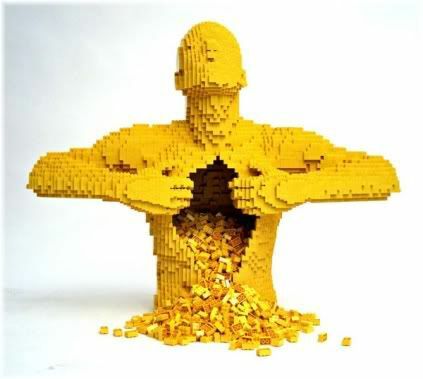 Yellow can indicate problems with the digestive or circulatory system. A yellowish coloration to the skin can indicate a weak digestive system and poor blood circulation, possibly as a result of eating an unhealthy diet, not exercising, and/or smoking. Red means that your body doesn’t agree with what you’ve eaten. A lined, puffy or red forehead, could mean that you’re eating too much rich, oily food such as processed meat, takeaways, fried food, cream, and butter, which affect the gallbladder. A puffy face is what the Chinese say results from “damp”. It’s caused by allergic reactions to food which then affect the stomach and spleen leading to improper food digestion and inflammation in the body. 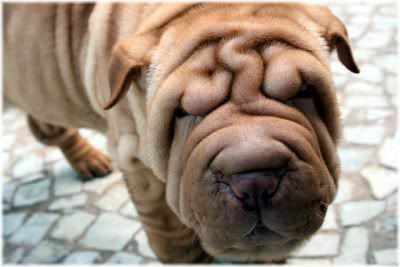 Wrinkles aren’t always a sign of old age. Interestingly, the Chinese believe that fine lines and wrinkles on the face are not necessarily a sign or consequence of aging, as they may be caused by an underlying problem in the body such as a vitamin or mineral deficiency. 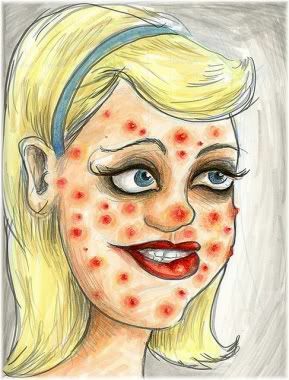 Persistent spots in the same parts of the face are often a sign of problems within. 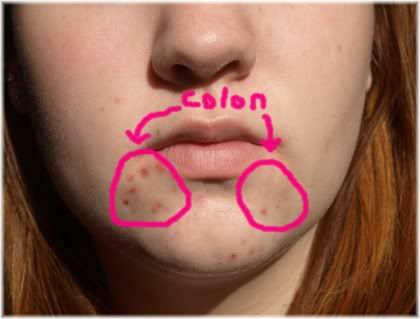 In younger adults, spots, pimples or zits that always appear in the same region of the face, such as on the chin, could indicate an underlying problem relating to the colon or kidneys. Spots in older adults, such as adult onset acne, are usually caused by hormonal changes due to stress, drugs, or pregnancy. If you are experiencing problems with a particular region of your face, have a look at the table listed shortly below to see what facial region corresponds to what internal organ. 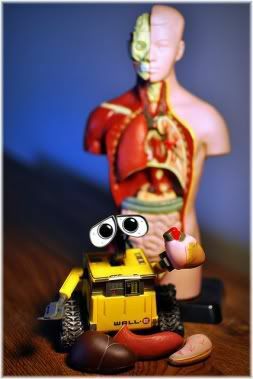 You can then read the description of that internal organ to find out what may be causing your problem. The Chinese believe that your face can reveal what’s going on inside your body. However, it’s important to note that problems on the skin may also be caused by external factors, rather than just solely being due to an issue with one of your organs. Touching your face with dirty hands, for example, can transfer bacteria to the face and cause breakouts of spots and pimples. Furthermore, some people are allergic to the ingredients in their skin care products, which can result in inflammation or reddening of the skin. So it’s important to rule out all possibilities before making a firm decision about what the cause of your problem may be. The table below will allow you to interpret your own facial readings. On the left is the facial region, and on the right is the corresponding organ(s). The skin is a very sensitive part of the body. 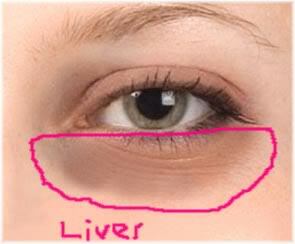 The kidney can be found underneath the eyes, along the eyebrows, on the ears, and on the chin in the Chinese face map. 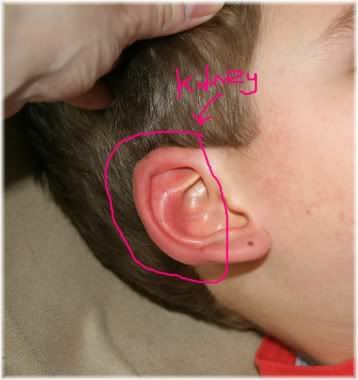 Problems relating to the kidneys usually appear as a blue coloration to the skin and/or skin that appears puffy. Kidney problems show up as the color blue. Such symptoms may be caused by too much stress, not get enough sleep, drinking too much caffeine, or eating too many refined or processed foods. A red coloration to your ears indicates overactive adrenal glands, possibly as a result of overworking yourself or being stressed too often. On the Chinese face map the liver can be found underneath your eyes, along your eyebrows, in the center of your forehead along your T-zone, and just above each side of your upper lip. 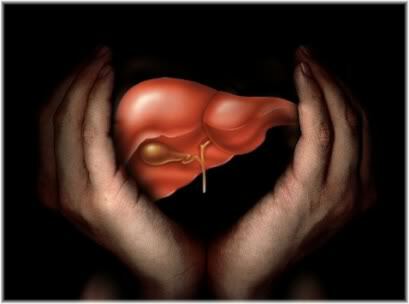 Liver problems show up as dark patches. Problems relating to the liver typically show up as a dark brown coloration to the skin, or breakouts of spots and pimples. Such symptoms may indicate that your liver is becoming overly stressed, possibly as a result of built up anger or frustration that you’re keeping inside of you. It may also be caused by the consumption of too many fatty foods, alcoholic beverages, or dairy products such as milk and cheese, which you are intolerant to. The stomach and colon can be found underneath the lower eyelid, in the center of the forehead, and along the sides of the face. 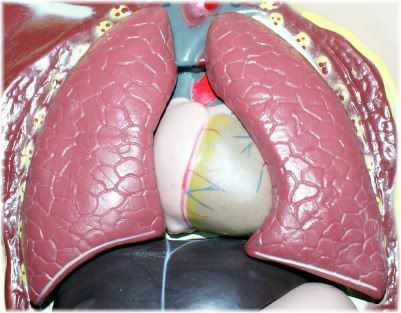 The stomach is also found on the upper lip, and the intestines along the lower lip. Problems relating to these organs can show up as a variety of different colors and effects on the skin. Problems relating to the digestive system can show up as white, red, green or yellow. For example, white spots, blotchy patches, or a red chin, can indicate that you are consuming too much sugar in your diet which is causing an overgrowth of yeast in your colon. Yeast infections, such as candida, can occur as a result of eating too much sugar. These symptoms may also be caused by eating too many mucus forming foods such as dairy products. A yellowish color around the mouth may indicate that you’re having trouble digesting your food, possibly because the foods you are eating contain very few live enzymes which would normally help to digest that food. On the other hand, a greenish color around the mouth may indicate that your liver is struggling with the foods you’re eating, possibly because you are eating unhealthy fats which the body finds difficult to process. Cracked or sore looking lips may indicate excess stomach acidity as a result of drinking acidic beverages like Coca-Cola. The lungs can be found to the sides of the nostrils above the lips and extending out onto the cheeks in the Chinese face map. The color red can signal lung problems. Problems relating to the lungs appear as a red coloration to the skin, puffiness, and breakouts of spots or pimples around the nostrils and cheek area. This may be caused by smoking, consuming too many mucus forming dairy products, living in a polluted environment, or a respiratory infection which is causing congestion of the lungs. On the Chinese face map the gallbladder can be found in the corners of the forehead and just above the middle of your eyebrows. Spots are often a sign of gallbladder problems. Problems relating to the gallbladder can show up as spots on the skin, or as a red discoloration of the skin. This is usually caused by eating too many fatty meals that contain bad fats along with too much alcohol. 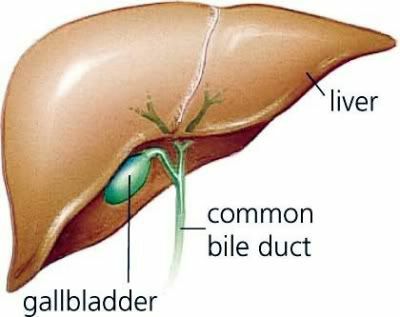 If you have problems with your gall bladder, you will probably also have problems with your liver. 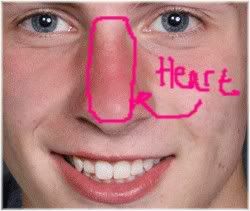 The heart can be found along the bridge of the nose and extending out from the nose running parallel underneath the eyes. Persistent redness on the nose or cheeks can signal heart or circulation problems. Problems relating to the heart or circulatory system can show up as persistent redness, similar to rosacea, on the upper bridge of the nose and on the cheeks. This may be caused by a lack of exercise, smoking, eating an unhealthy diet, allergies to skin care products, or eating foods which are causing an allergic response within the body. 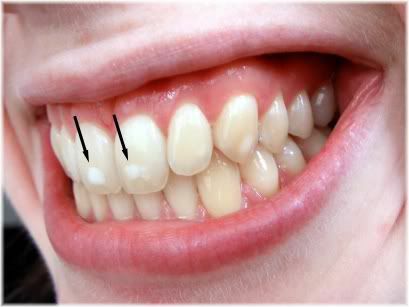 White spots on the teeth can indicate toxic levels of fluoride in the body. This can occur as a result of the teeth being treated with fluoride by a dentist, or as a result of drinking fluoridated water. Dental fluorosis caused by too much fluoride exposure. Fluoride is an extremely toxic substance. It’s more toxic than lead, and just a little less toxic than arsenic. High levels of fluoride exposure have been linked to a reduction in intelligence, typically lowering one’s IQ score by around 6-7 points. Fluoride accumulates within the body with each subsequent exposure due to its half-life of 20 years. This means that the symptoms caused by the toxic effects of fluoride will gradually get worse and more noticeable with age. Note: High doses of iodine may be helpful in detoxing fluoride from the body. Too much sugar in diet (yeast infection).